Is a month off drinking just what you need to achieve your fitness goals? If you’ve been stuck in the cycle of training like a demon all week-long only to party like a demon all weekend-long, Dry July could be just what you need to shake it up and see some real results in the gym – and in the mirror. Sometimes sweating it out in the gym all week simply can’t outweigh a weekend medley of bar-hopping, drinks at the footy, late-night kebabs and hungover fry ups. Even if you’ve been hitting the treadmill like mad and sticking to your diet 100%, if you’re failing to see any progress, alcohol could very well be the culprit. Thankfully, winter is the ideal time to step back from the party scene and prepare yourself for a month of increased mental clarity, higher intensity workouts and accelerated fat loss. Get a head-start on the spring shred crew by swapping the after-work beers for a gym sesh and a thermogenic protein powder such as Vitalstrength Hydroxy Ripped Protein. Designed to get you lean and ripped, Vitalstrength Hydroxy Ripped delivers high protein plus clinically proven fat burners to build strong, lean muscle faster. When you drink alcohol – whether it’s beer, wine or your saintly vodka, lime & soda – your body prioritises the metabolism of ethanol in those beverages above all else. Considering that the metabolic by-product of alcohol (acetate) is toxic, it makes sense for the body to eliminate it ASAP. Meanwhile, other energy sources (e.g. F/P/C) will not be used until all of the ethanol has been metabolised, if at all. The really bad news for your abs? Alcohol puts the brakes on fat oxidation, allowing dietary fat to more easily be stored in fat cells. Alcohol is calorie dense, with seven calories per gram. That’s almost twice as calorie dense as carbs, and is right up there with the number of calories per gram of fat (which sits at 9). And with little-to-no nutritional value, that’s a lot of empty calories. While alcohol itself is difficult to convert into fat, it does compromise the body’s ability to burn calories and promotes excess fat storage. As a result, it’s important to carefully consider what you’re eating on days that you’ll be drinking and ensure your lowered inhibitions don’t lead to a complete blow-out. That packet of crisps at the bar and cheeky late night burger could be contributing to your love handles rather than your #gains. Alcohol’s impact on performance reaches far beyond the bedroom, so even if you can drag yourself to the gym after a night on the cans, you’re unlikely to see the gains you’re striving for. Dehydration is likely to have you feeling sluggish, uncomfortable and unable to push it as hard as you usually would. When you exercise you need to be well-hydrated to maintain the flow of blood through your body, which is essential for circulating oxygen and nutrients to your muscles. Hydration also helps control your body temperature, so you’re more likely to overheat. Testosterone is a highly potent muscle-building hormone and is crucial for maximum muscle growth. Alcohol consumption not only reduced testosterone levels, it also increases estrogen levels – a terrible combo for your lean muscle mass gains. And it gets worse. While alcohol is absorbed rapidly, it is metabolised very slowly, and as such its effects may still impact performance and testosterone levels up to 48 hours after your last drink. That’s a lot of lost gains. Anyone serious about building muscle knows that sleep is critical to growth; it’s when your body recovers and repairs itself, growth hormone is produced and protein synthesis occurs. Alcohol significantly disrupts sleep, robbing you of much-needed deep and REM sleep. Miss out on that slow-wave sleep and your body’s ability to build muscle is reduced. Adequate sleep is also essential for the mental alertness you need to smash a training session; without it, your time in the gym could be largely wasted. After a night of drinking it’s common to feel tired and crave sugar to artificially generate energy. Lack of quality sleep reduces levels of the appetite-suppressing hormone leptin, which can lead to a constant feeling of hunger and a general slow-down of your metabolism. Studies have also shown that alcohol can have a big impact on appetite and subsequent food consumption. Add to that a decrease in inhibitions and impaired decision making… Macca’s Family Meal, anyone?! The struggle of dragging yourself out of bed to hit the gym after a night of drinking is all too real. Alcohol can create mental and physical roadblocks to gains, sapping you of your motivation and energy to train. Alcohol tends to limit the metabolism of other substances in the body. Slower metabolism of glycogen, the brain’s main source of energy, leads to poor brain function and lack of mental focus on the gym floor. Meanwhile limited carbohydrate metabolism means muscle glycogen levels dip, fatigue sets in quicker and endurance suffers. Take the challenge and let’s see how much you can achieve in one month! Support your efforts in the gym and in the kitchen with quality supplements scientifically developed to help build your ultimate body faster. 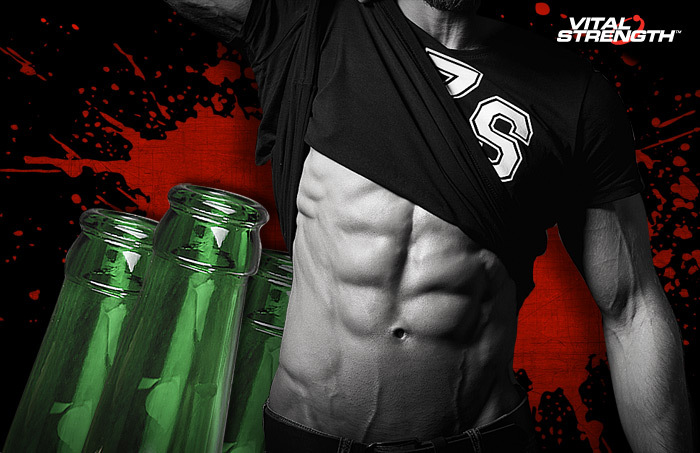 Enhance your lean muscle gains with Vitalstrength Hydroxy Ripped, a high protein formula plus aggressive fat metabolisers for a shredded physique. Want to amp it up? Combine with VS-8 Thermogenic Burner capsules, containing a specialised combination of 8 proven thermogenic ingredients that help to increase your fat burning rate, stimulate mental alertness and assist with appetite control. Head to www.dryjuly.com to sign up or donate to a great cause.